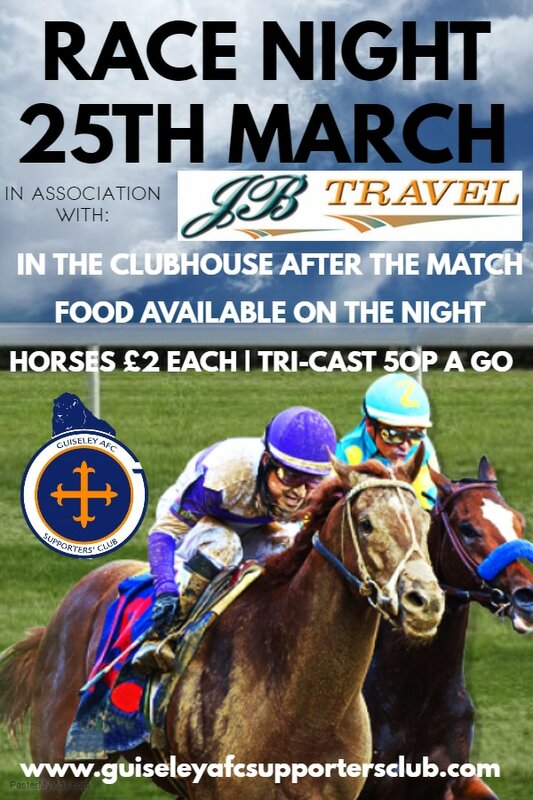 The popular and traditional Race Night event is back in association with J & B Travel. It will take place on Saturday 25th March after the visit of Dover Athletic. There will be eight races initially scheduled. A further race could be added on the night. ​The cost of a horse is just £2 and horses will be on sale at all home games including 25th March unless they sell out by then. The Tri Cast is just 50p a go and is available to purchase at our desk on home matchdays. Food will be served on the evening. There will also be a football card/raffle taking place on the night. Big thanks to the following businesses who have all sponsored races: Doris Dent Estate Agents, Hillcourt Plasterers, Subway Guiseley, The Station Pub, Good Skin Days, Everybody's, Sarah Louise Hair Salon and Premium Homes. You can mark your attendance on our Facebook page by clicking the below button.